Concerts and Art Exhibits at St. Paul's Cathedral have a special niche in the arts world of Greater Burlington and beyond. As a church our space is principally liturgical in function, while as an arts venue in Burlington it is eagerly sought out for its superior acoustics and flexible seating as well as unique light, neutral color and height. Part of the declared intention in the design of the current building was to provide a welcoming space for the arts in many forms. An amazing series of exhibits by nationally recognized artists as well as shows of local interest grace the walls much of the year. Art shows are admission-free; sales resulting from the exhibits bring in a small donation to the Cathedral Arts Ministry. In addition, the Cathedral Arts Ministry includes performances by nationally-known musicians as well as a number of the remarkable groups in the greater Burlington area, at both ticketed and free events. Please see a calendar of upcoming performances below. A devoted cadre of volunteers usher, sell and take tickets, and move chairs. New volunteers are always welcome. For more information, please contact Jenny Sisk. 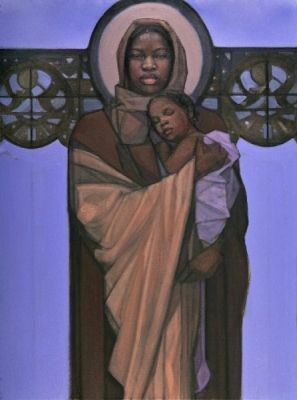 Check out this link to a short documentary about the life and work of Vermont painter Janet McKenzie, who is challenging traditional Christian images by using women and people of color in depictions of Jesus, Mary, and other Biblical figures. The Cathedral Church of St. Paul hosted an exhibit of her work in November of 2016, and is lucky enough to have a painting of Janet's, called "Mary and Jesus with the papel picado," (seen left) as part of our permanent collection. https://www.youtube.com/watch?v=tCYTIBHzQBA. The Tuesday 12-1 program is a series of performances by a diverse group of musicians that take place at the Cathedral every Tuesday. Performances are free of charge and begin at 12 noon unless otherwise noted. Bring a bag lunch; coffee and tea are provided. Renowned Lake Champlain Chamber Music Festival players present a varied program of solo organ and solo cello works as well as two beautiful Bach arias - the Fugue in G "Jig;" "Bete Aber Auch Dabei;" and the Cello Suite No. 4 in E-flat Major. Starts at 12:15. Ms. Bower presents a diverse program of baroque music suited to the brilliant Wilhelm organ, juxtaposing melancholic themes and pieces inspired by political discord with soaring melodies of change. Featuring works by Bach, Froberger, Tomkins, and Scheidt. A favorite in previous seasons, Champlain Consort performs Renaissance and Elizabethan music on period instruments, especially recorders and sackbuts (Renaissance trombones). Expect a nod in their program to Halloween and All Saints Day. Kevin Lawrence and Robert Rachlin return for a program of works for violin and piano. Program details TBA. The University of Vermont's select choir presents an annual concert of seasonal works. ​Starts at 12:15. Enjoy this annual concert featuring some of Vermont's most gifted emerging musicians. April 30, 2019 ~ Gotta Play Schubert - Again! Last spring we hosted a performance of Schubert's Octet for a mixed ensemble of woodwinds and strings made up of players from the Craftsbury Chamber Players, Scrag Mountain Music, TurnMusic and the Vermont Symphony. It was a glorious performance played to a capacity house. Because we all had such a good time, they're gleefully going to do it again. You won't want to miss it! This fine chorus of young singers shares highlights of their spring program. Since 2001, Syrinx has enjoyed offering quality choral music from various traditions to the community, especially to those in senior living communities. From Bach to Broadway, by way of Spirituals and other genres, they embody the pleasure that the gift of music can provide. All tickets are available at the door just prior to the performance. Parking at the Cathedral is free on Sundays only. There is free parking for two hours all other days at the city parking garage across Cherry Street. Capital City Concerts presents J.S. Bach's Magnificat, the Brandenburg Concerto #2 and arias featuring world-renowned vocal soloists, choir, and orchestra. Admission: Adults $25; Students 18 and under, and reduced income, $15. Counterpoint, Vermont's professional vocal ensemble, welcomes organist Susan Summerfield in a joyful winter concert to anticipate the birth of Jesus and the return of light. The program features arrangements by Robert De Cormier; classic sacred choral works; a stunning new setting of Nancy Tillman's beloved children's book On the Night You Were Born by Upper Valley-based composer Travis M. Ramsey; and a world premiere by Brookfield composer Erik Nielsen. Admission: $20; Seniors: $15; Students and limited means: $5; ages 5 and under: free. Pianist Matthew Manwarren is no stranger to the Cathedral Arts Series, having performed here on multiple occasions. Currently serving as Professor of Piano at Winthrop University and as Visiting Artist Professor of Piano at the University of South Carolina, he has been a mmember of hte summer faculty at hte Adamant Music School in Bermont since 1998. HIs program features Schubert's B-Flat Sonata, along with pieces by Liszt, Debussy, and Scriabin. Admission: $25; Students 15-22 and Seniors (62+): $15; Children 14 and under: $5. Free and open to the public. Sponsored by Cathedral Arts and Greenfield Piano Associates. Members of GPA perform a "variety show" of classical piano solos and duets by composers of all styles, Baroque to modern. Admission by donation to Greenfield Piano Associates Scholarship Fund. ​To receive email announcements about concerts, please send your request to info@cathedralarts.org.